For other uses, see Lost tribe. The ten lost tribes were the ten of the twelve tribes of ancient Israel that were said to have been deported from the Kingdom of Israel after its conquest by the Neo-Assyrian Empire circa 722 BCE. Claims of descent from the "lost" tribes have been proposed in relation to many groups, and some religions espouse a messianic view that the tribes will return. The motif of "the lost tribes" first appeared in the post-biblical era, and a number of apocryphal texts subsequently elaborated upon the theme. In the 7th and 8th centuries CE the return of the lost tribes was associated with the concept of the coming of the messiah. Recorded history is at variance with the legends elaborated in apocryphal texts. Historian Tudor Parfitt has declared that "the Lost Tribes are indeed nothing but a myth", and writes that "this myth is a vital feature of colonial discourse throughout the long period of European overseas empires, from the beginning of the fifteenth century, until the later half of the twentieth". Zvi Ben-Dor Benite states: "The fascination with the tribes has generated, alongside ostensibly nonfictional scholarly studies, a massive body of fictional literature and folktale." Anthropologist Shalva Weil has documented differing tribes and peoples claiming affiliation to the Lost Tribes throughout the world. Some DNA studies have refuted any connection between modern-day ethnic Jews and most of the ethnic groups discussed below as possible Lost Tribe candidates. For example, a recently published study into the genetic origins of Japanese people does not support a genealogical link. The Scriptural basis for the idea of "10 Lost Tribes" is 2 Kings 17:6: "In the ninth year of Hoshea, the king of Assyria captured Samaria and deported the Israelites to Assyria. He settled them in Halah, in Gozan on the Habor River and in the towns of the Medes." According to the Hebrew Bible, Jacob (who was later named Israel; Gen 35:10) had 12 sons and at least one daughter (Dinah) by two wives and two concubines. The twelve sons fathered the twelve Tribes of Israel. Jacob elevated the descendants of Ephraim and Manasseh (the two sons of Joseph by his Egyptian wife Asenath) (Genesis 41:50) to the status of full tribes in their own right, replacing the Tribe of Joseph (Genesis 48:5). Each received its own land and had its own encampment during the 40 years of wandering in the desert. According to the Bible, the Kingdom of Israel (or Northern Kingdom) was one of the successor states to the older United Monarchy (also called the Kingdom of Israel), which came into existence in about the 930s BCE after the northern Tribes of Israel rejected Solomon's son Rehoboam as their king. Nine landed tribes formed the Northern Kingdom: the tribes of Reuben, Issachar, Zebulun, Dan, Naphtali, Gad, Asher, Ephraim and Manasseh. In addition, some members of Tribe of Levi, who had no land allocation, were found in the Northern Kingdom. The Tribes of Judah and Benjamin remained loyal to Rehoboam, and formed the Kingdom of Judah (or Southern Kingdom). Members of Levi and the remnant of Simeon were also found in the Southern Kingdom. According to 2 Chronicles 15:9, members of the tribes of Ephraim, Manasseh and Simeon "fled" to Judah during the reign of Asa of Judah (c. 911 - 870 BCE). Whether these groups were absorbed into the population or remained distinct groups, or returned to their tribal lands is not indicated. In c. 732 BCE, the Assyrian king, Tiglath-Pileser III sacked Damascus and Israel, annexing Aramea and territory of the tribes of Reuben, Gad and Manasseh in Gilead including the desert outposts of Jetur, Naphish and Nodab. People from these tribes, including the Reubenite leader, were taken captive and resettled in the region of the Khabur River system in Assyria/Mesopotamia. Tiglath-Pilesar also captured the territory of Naphtali and the city of Janoah in Ephraim and an Assyrian governor was placed over the region of Naphtali. According to 2 Kings 16:9 and 15:29, the population of Aram and the annexed part of Israel was deported to Assyria. Israel continued to exist within the reduced territory as an independent kingdom subject to Assyria until around 725-720 BCE, when it was again invaded by Assyria and the rest of the population deported. The Bible relates that the population of Israel was exiled, leaving only the Tribe of Judah, the Tribe of Simeon (that was "absorbed" into Judah), the Tribe of Benjamin and the people of the Tribe of Levi who lived among them of the original Israelites tribes in the southern Kingdom of Judah. However, Israel Finkelstein estimated that only a fifth of the population (about 40,000) were actually resettled out of the area during the two deportation periods under Tiglath-Pileser III, Shalmaneser V and Sargon II. Many also fled south to Jerusalem, which appears to have expanded in size fivefold during this period, requiring a new wall to be built, and a new source of water (Siloam) to be provided by King Hezekiah. Furthermore, 2 Chronicles 30:1-11 explicitly mentions northern Israelites who had been spared by the Assyrians—in particular, members of Dan, Ephraim, Manasseh, Asher and Zebulun—and how members of the latter three returned to worship at the Temple in Jerusalem at that time. 2 Kings 17:34 says of the newly exiled Israelites that were in Assyria: "To this day they persist in their former practices. They neither worship Yahweh nor adhere to the decrees and regulations, the laws and commands that Yahweh gave the descendants of Jacob, whom he named Israel." The medieval rabbi and biblical commentator David Kimhi explains that this is in reference to the tribes that were exiled, and that they remained in their ways, neither accepting a monotheistic God nor in adhering to any of the laws and regulations that were common to all Jews. And he said to Jeroboam, Take thee ten pieces: for thus saith the LORD, the God of Israel, Behold, I will rend the kingdom out of the hand of Solomon, and will give ten tribes to thee. Centuries after their disappearance, the ten lost tribes sent an indirect but vital sign ... In 2 Esdras, we read about the ten tribes and "their long journey through that region, which is called Arzareth" ... The book of the "Vision of Ezra", or Esdras, was written in Hebrew or Aramaic by a Palestinian Jew sometime before the end of the first century CE, shortly after the destruction of the temple by the Romans. It is one of a group of texts later designated as the so-called Apocrypha—pseudoepigraphal books attached to but not included in the Hebrew biblical canon. Some evidence exists of a continuing identification in later centuries of individual Israelites to the Lost Tribes. For example, in Luke 2:36 of the New Testament, an individual is identified with the tribe of Asher. Son of man, take a stick and write on it, ‘For Judah, and the people of Israel associated with him’; then take another stick and write on it, ‘For Joseph (the stick of Ephraim) and all the house of Israel associated with him.’ 17 And join them one to another into one stick, that they may become one in your hand. There are discussions in the Talmud as to whether the ten lost tribes will eventually be reunited with the Tribe of Judah, that is, with the Jewish people. In 1605, Jesuit missionary Matteo Ricci discovered a small community consisting of approximately ten to twelve families of Chinese Jews in Kaifeng, China, the Kaifeng Jews. According to historical records, a Jewish community in Kaifaeng built a synagogue in 1163 during the Southern Song Dynasty, which existed until the late nineteenth century. The Portuguese traveler and Marrano Sephardic Jew Antonio de Montezinos returned to Europe with accounts that some of the Lost Tribes were living as Native Americans of the Andes in South America. Menasseh ben Israel, a noted rabbi and printer of Amsterdam, was excited by this news. He believed that a Messianic age was approaching, and that having Jewish people settled around the world was necessary for it. "...for the Scriptures do not tell what people first inhabited those Countries; neither was there mention of them by any, til Christop. Columbus, Americus, Vespacius, Ferdinandus, Cortez, the Marquesse Del Valle, and Franciscus Pizarrus went thither..."
In 1655, Menasseh ben Israel petitioned Oliver Cromwell to allow the Jews to return to England in furtherance of the Messianic goal. (Since the Edict of Expulsion in 1290, Jews had been prohibited by law from living in England.) With the approach of 1666, considered a significant date, Cromwell was allegedly interested in the return of the Jews to England because of the many theories circulating related to millennial thinking about the end of the world. Many of these ideas were fixed upon the year 1666 and the Fifth Monarchy Men who were looking for the return of Jesus as the Messiah; he was expected to establish a final kingdom to rule the physical world for a thousand years. Messianic believers supported Cromwell's Republic in the expectation that it was a preparation for the fifth monarchy—that is, the monarchy that should succeed the Babylonian, Persian, Greek, and Roman world empires. Apocryphal accounts concerning the Lost Tribes, based to varying degrees on biblical accounts, have been produced by both Jews and Christians since at least the 17th century. An Ashkenazi Jewish tradition speaks of these tribes as Die Roite Yiddelech, "The little red Jews", cut off from the rest of Jewry by the legendary river Sambation, "whose foaming waters raise high up into the sky a wall of fire and smoke that is impossible to pass through". The continued belief in the Lost Tribes is unabated... The present writer does not believe that the Ten Tribes are still to be found and accepts their disappearance as a historical fact that requires no further proof. The Church of Jesus Christ of Latter-day Saints (LDS Church) believes in the literal gathering of Israel, and the LDS Church actively preaches the gathering of people from the twelve tribes. "Today Israelites are found in all countries of the world. Many of these people do not know that they are descended from the ancient house of Israel," the church teaches in its basic Gospel Principles manual. "The Lord promised that His covenant people would someday be gathered .... God gathers His children through missionary work. As people come to a knowledge of Jesus Christ, receiving the ordinances of salvation and keeping the associated covenants, they become 'the children of the covenant' (3 Nephi 20:26)." The church also teaches that "The power and authority to direct the work of gathering the house of Israel was given to Joseph Smith by the prophet Moses, who appeared in 1836 in the Kirtland Temple.... The Israelites are to be gathered spiritually first and then physically. They are gathered spiritually as they join The Church of Jesus Christ of Latter-day Saints and make and keep sacred covenants.... The physical gathering of Israel means that the covenant people will be “gathered home to the lands of their inheritance, and shall be established in all their lands of promise” (2 Nephi 9:2). The tribes of Ephraim and Manasseh will be gathered in the Americas. The tribe of Judah will return to the city of Jerusalem and the area surrounding it. The ten lost tribes will receive from the tribe of Ephraim their promised blessings (see D&C 133:26–34). . . The physical gathering of Israel will not be complete until the Second Coming of the Savior and on into the Millennium (see Joseph Smith—Matthew 1:37)." Regarding the Ezekiel 37 prophecy, the LDS Church teaches that the Book of Mormon is the stick of Ephraim (or Joseph) mentioned and that the Bible is the stick of Judah, thus comprising two witnesses for Jesus Christ. The LDS Church believes the Book of Mormon to be a collection of records by prophets of the ancient Americas, written on plates of gold and translated by Joseph Smith c. 1830. The LDS Church considers the Book of Mormon one of the main tools for the spiritual gathering of Israel. Expanded exploration and study of groups throughout the world through archeology and the new field of anthropology in the late 19th century led to a revival or reworking of accounts of the Lost Tribes. For instance, because archeological finds of the Mississippian culture's complex earthwork mounds seemed beyond the skills of the Native American cultures known to European Americans at the time of their discovery, it was theorized that the ancient civilizations involved in the mounds' construction were linked to the Lost Tribes. They tried to fit new information into a biblical construct. However, the earthworks across North America have been conclusively linked to various Native groups, and most archaeologists now consider the theory of non-Native origin to be pseudo-science and even racist. After learning about normative Judaism in the 19th century, the Bene Israel often migrated from villages in Konkan to nearby cities, which included Mumbai, Pune, Ahmedabad, and Karachi, in today's Pakistan. Based on Bene Israel tradition, after centuries of traveling through western Asia from Israel, their ancestors migrated to India and slowly assimilated to their surrounding community, while maintaining particular Jewish traditions. David Rahabi, an Indian Jew, found the Bene Israel in the 18th century and took note of their Jewish customs. Some historians note that the ancestors of the Bene Israel belonged to the one of the Lost Tribes of Israel; however, Jewish authorities have not officially recognized the Bene Israel as one of the Lost Tribes. According to the Jerusalem Post, in 2002, a DNA study linked the descendants of Bene Israel to the Cohanim (Tribe of Levi). Since the late 20th century, some tribes in the Indian North-Eastern states of Mizoram and Manipur claim they are Lost Israelites and have been studying Hebrew and Judaism. The Beta Israel ("House of Israel") are Ethiopian Jews, who were also called "Falashas" in the past. Some members of the Beta Israel, as well as several Jewish scholars, believe that they are descended from the lost Tribe of Dan, as opposed to the traditional story of their descent from the Queen of Sheba. They have a tradition of connection to Jerusalem. Early DNA studies showed they were descended from Ethiopians, but in the 21st century, new studies have shown possible connection to a few Jews of the 4th to 5th century, possibly living in Sudan. The Beta Israel made contacts with other Jewish communities in the later 20th century. After Halakhic and constitutional discussions, Israeli officials decided on March 14, 1977 that the Israeli Law of Return applied to the Beta Israel. The Igbo Jews of Nigeria claim descent variously from the tribes of Ephraim, Naphtali, Menasseh, Levi, Zebulun and Gad. The theory, however, does not hold up to historical scrutiny. Historians have examined the historical literature on West Africa from the colonial era and elucidated diverse functions which such theories served for the writers who proposed them. The Pashtuns are a predominantly Muslim people, native to Afghanistan and Pakistan, who adhere to a pre-Islamic indigenous religious code of honor and culture, Pashtunwali. The myth about Pashtuns being from the lost tribes of Israel has never been substantiated through concrete historical evidence. Genetic studies also refute the myth. Many members of the Taliban hail from the Pashtun tribes and do not necessarily refute their "Israelite" descent. The tribal name 'Yusef Zai' in Pashto has been claimed to translate as the "sons of Joseph", as described in Makhzan-i-Afghani, a historical work from the 17th century by Nehamtullah, an official in the royal court of Mughal Emperor Jehangir. A similar story is told by Iranian historian Ferishta. A number of genetics studies refute the possibility of a connection, whereas others maintain a link. In 2010, The Guardian reported that Israel was to fund a genetic study to test the veracity of a genetic link to the lost tribes of Israel. The article stated "Historical and anecdotal evidence strongly suggests a connection, but definitive scientific proof has never been found. Some leading Israeli anthropologists believe that, of all the many groups in the world who claim a connection to the 10 lost tribes, the Pashtuns, or Pathans, have the most compelling case." A depiction of either King Jehu, or Jehu's ambassador, kneeling at the feet of Shalmaneser III on the Black Obelisk. Several theories claim that the Scythians and/or Cimmerians were in whole or in part the Lost Tribes of Israel. These are generally based on the belief that the Northern Kingdom of Israel, which had been deported by the Assyrians, became known in history as the Scythians and/or Cimmerians. Various points of view exist as to their modern descendants. The Behistun Inscription is often cited as a link between the deported Israelites, the Cimmerians and the Scythians (Saka). We have reasonable grounds for regarding the Gimirri, or Cimmerians, who first appeared on the confines of Assyria and Media in the seventh century B.C., and the Sacae of the Behistun Rock, nearly two centuries later, as identical with the Beth-Khumree of Samaria, or the Ten Tribes of the House of Israel. Adherents point out that the Behistun Inscription connects the people known in Old Persian and Elamite as Saka, Sacae or Scythian with the people known in Babylonian as Gimirri or Cimmerian. It should be made clear from the start that the terms 'Cimmerian' and 'Scythian' were interchangeable: in Akkadian the name Iskuzai (Asguzai) occurs only exceptionally. Gimirrai (Gamir) was the normal designation for 'Cimmerians' as well as 'Scythians' in Akkadian. E. Raymond Capt, a British Israelite, claimed similarities between King Jehu's pointed headdress and that of the captive Saka king seen to the far right on the Behistun Inscription. 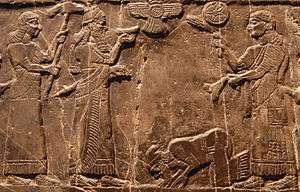 He also posited that the Assyrian word for the House of Israel, Khumri, which was named after Israel's King Omri of the 8th century BC, is connected phonetically to Gimirri (Cimmerian). Critics of the Israel/Scythian theory argue that the customs of the Scythians and Cimmerians differ from those of the Ancient Israelites. In addition, the greater body of research on the history of ancient populations does not provide support for the purported links between these ancient populations. The society was active in trying to convert the Indians but suspected that they might be Jews and realized they better be prepared for an arduous task. Thorowgood's tract argued that the native population of North America were descendants of the Ten Lost Tribes. In 1652 Sir Hamon L'Estrange, an English author writing on topics such as history and theology published an exegetical tract called Americans no Jews, or improbabilities that the Americans are of that Race in response to the tract by Thorowgood. In response to L'Estrange, Thorowgood published a second edition of his book in 1660 with a revised title and included a foreword written by John Eliot, a Puritan missionary to the Indians who had translated the Bible into an Indian language. It is in fact in Japan that we can trace the most remarkable evolution in the Pacific of an imagined Judaic past. As elsewhere in the world, the theory that aspects of the country were to be explained via an Israelite model was introduced by Western agents. Several other authors have followed McLeod in speculating about parallels between Japanese and Israelite rituals, culture and language in an attempt to support the hypothesis. Arimasa Kubo, an ordained Christian minister, has translated McLeod's book into Japanese, and has published a number of works on the topic. In his article, "Mystery of the Ten Lost Tribes: Japan," he asserts that many traditional customs and ceremonies in Japan are very similar to those of ancient Israel. He postulates that perhaps these rituals came from the Jews through members of the Ten Lost Tribes of Israel, who might have come to ancient Japan. Jon Entine emphasizes that DNA evidence shows there are no genetic links between Japanese and Israelite people. The Lemba people (Vhalemba) from Southern Africa claim to be descendants of several Jewish men who traveled from what is now Yemen to Africa in search of gold, where they took wives and established new communities. Recent research published in the South African Medical Journal studied Y-chromosomes variations in two groups of Lemba, one South African and the other Zimbabwean (the Remba). It concluded that "While it was not possible to trace unequivocally the origins of the non-African Y chromosomes in the Lemba and Remba, this study does not support the earlier claims of their Jewish genetic heritage." The researcher suggested "a stronger link with Middle Eastern populations, probably the result of trade activity in the Indian Ocean." They have specific religious practices similar to those in Judaism and a tradition of being a migrant people, with clues pointing to an origin in West Asia or North Africa. According to the oral history of the Lemba, their ancestors were Jews who came from a place called Sena several hundred years ago and settled in East Africa. Sena is an abandoned ancient town in Yemen, located in the eastern Hadramaut valley, which history indicates Jews inhabited in past centuries. Some research suggests that "Sena" may refer to Wadi Masilah (near Sayhut) in Yemen, often called Sena, or alternatively to the city of Sana'a, also located in Yemen. British Israelism (also known as 'Anglo-Israelism') espouses a theory that people of Western European descent, especially Britain and the United States, are descended from the lost tribes of Israel. Adherents argue that the deported Israelites became Scythians/Cimmerians who are ancestors of the Celts/Anglo-Saxons of Western Europe. The theory arose in England, whence it spread to the United States. During the 20th century, British Israelism was promoted by Herbert W. Armstrong, founder of the Worldwide Church of God. Armstrong argued that this theory provided a 'key' to understanding biblical prophecy; he felt called to proclaim these prophecies to the 'lost tribes' of Israel before the coming of the 'end-times'. The Worldwide Church of God no longer teaches the theory, but some offshoot churches such as the Philadelphia Church of God, the Church of God, a Worldwide Association, and the Living Church of God continue to teach it. One notable adherent to British Israelism was Alberta premier "Bible Bill" Aberhart. Brit-Am, sometimes confused with British Israelism, is an organization centered in Jerusalem, and composed of Jews and non-Jews. Brit-Am, like British Israel, identifies the Lost Ten Tribes with peoples of West European descent, but does so from a Jewish perspective, quoting both biblical and Rabbinical sources. It uses Rabbinical Commentary supplemented by secular theories that posit the Lost Tribes/Scythian/Cimmerian connection, which are believed to have been ancestors of current Western European cultures and nations. An example of Brit-Am scholarship may be seen from its treatment of Obadiah 1:20 in Hebrew. Obadiah mentions "Galut HaHail HaZeh" i.e. "this First Exile" being in "Tsarafath", where the original Hebrew was understood by Rabbinical commentators such as Rashi and Don Isaac Abrabanel as referring to the Lost Ten Tribes in France and England. Brit-Am also believes that "Other Israelite Tribes gave rise to elements within Finland, Switzerland, Sweden, Norway, Ireland, Wales, France, Holland, and Belgium" and that "The Tribe of Dan is to be found amongst part of the Danish, Irish, and Welsh." Brit-Am also believes that the Khazars were descended from the Ten Tribes and quotes Jewish and non-Jewish sources that were contemporaneous with them. Other organizations teach other variants of the theory, including the claim that the Scythians/Cimmerians represented in whole or in part the Lost Ten Tribes. One such theory posits that the lost Israelites can be defined by the Y-DNA haplogroup R, which makes up much of the population of Europe and Russia, which is in conjunction to British Israelism and Brit-Am, which believe that the Israelites crossed the Bosphorus into modern day Turkey, from there they made their way to Odessa on the Black Sea (former Russia) and over a period of time travelled through Eastern Europe, then into Western Europe through France and onto the British Isles, including Ireland. The search for the Ten Lost Tribes continues unabated to the present. In recent years, groups in Africa, such as Ghana, Cameroon, Rwanda and other countries have claimed to be Lost Tribes; so too, tribes in Papua New Guinea and in Burma have emerged with similar claims. Some of these groups, like the Bnei Menashe, are trying (and succeeding) to align with the Jewish people in the state of Israel. Shavei Israel seeks to find "lost Jews." Bruder, Édith: Black Jews of Africa, Oxford 2008. Lange, Dierk: "Yoruba origins and the 'Lost Tribes of Israel'", Anthropos 106 (2011), 579-595. Parfitt, Tudor: The Lost Tribes of Israel: The History of a Myth, London 2002. Parfitt, Tudor: "The Black Jews of Africa and the Americas" Harvard University Press, Cambridge, 2012. Weil, Shalva: Beyond the Sambatyon: the Myth of the Ten Tribes, Tel Aviv 1991. Jones, Erik, "The United States, Britain and the Commonwealth in Prophecy", 2016. Jacobovici, Simcha, Quest for the Lost Tribes, 2003. ↑ Weil, S. 2012 'Tribes, Ten Lost', in Jewish Folklore and Traditions: A Multicultural Encyclopedia, (Raphael Patai and Haya Bar Itzhak eds.) ABC-CLIO, Inc., 2: 542-543. 1 2 Parfitt, Tudor (2003). The Lost Tribes of Israel: The History of a Myth. Phoenix. pp. 1, 225. ↑ Weil, S. 1991 'Beyond the Sambatyon: the Myth of the Ten Lost Tribes'. Tel-Aviv: Beth Hatefutsoth, the Nahum Goldman Museum of the Jewish Diaspora. ↑ Finkelstein & Silberman 2001, The Bible Unearthed. ↑ Weil, S. 1991 'Beyond the Sambatyon: the Myth of the Ten Lost Tribes', in Ariel, 85-86:25-31. ↑ Parfitt, Tudor (2003). The Lost Tribes of Israel: The History of a Myth. Phoenix. p. 69. 1 2 Méchoulan, Henry, and Nahon, Gérard (eds. ), Menasseh Ben Israel. The Hope of Israel, Oxford University Press, Oxford, 1987 - ISBN 0-19-710054-6, p. 101 and passim. ↑ Moses Rosen. "The Recipe" (published as epilogue to The Face of Survival, 1987). Nathan Ausubel. Pictorial History of the Jewish People, Crown, 1953. ↑ Moses Rosen. "The Recipe" (published as epilogue to The Face of Survival, 1987). ↑ Nelson, Russell M. (November 2006). "The Gathering of Scattered Israel". Liahona. The Church of Jesus Christ of Latter-day Saints. Retrieved 23 April 2013. ↑ Gospel Principles, chapter 42, "The Gathering of the House of Israel". ↑ Weil, S. 2013 'Ten Lost Tribes', in Judith Baskin (ed.) Cambridge Dictionary of Judaism and Jewish Culture, New York: Cambridge University Press, 616. ↑ Neusius, Sarah W., and G. Timothy Gross (2014) Seeking Our Past: An Introduction to North American Archaeology (second edition). Oxford University Press. ↑ Weil, Shalva 1981 The Jews from the Konkan: the Bene IsraelCommunity of India. Tel-Aviv: Beth Hatefutsoth, the Nahum Goldman Museum of the Jewish Diaspora. ↑ Weil, Shalva (2009) . "Bene Israel Rites and Routines". In Weil, Shalva. India’s Jewish Heritage: Ritual, Art and Life-Cycle (3rd ed.). Mumbai: Marg Publications. pp. 78–89. ↑ Weil, Shalva (1994). "Yom Kippur: the Festival of Closing the Doors". In Goodman, Hananya. Between Jerusalem & Benares: Comparative Studies in Judaism & Hinduism. New York: State University of New York Press. pp. 85–100. ↑ Weil, S (2004b). "Lost Israelites from North-East India: Re-Traditionalisation and Conversion among the Shinlung from the Indo-Burmese Borderlands". The Anthropologist. 6 (3): 219–233. 1 2 Weil, S. 2011 'Via India to Israel: The Migrations of the Bnei Menashe', International Relations and Security Network (ISN). Web. http://www.isn.ethz.ch/Digital-Library/Articles/Detail/?ots591=4888caa0-b3db-1461-98b9-e20e7b9c13d4&lng=en&id=133889. ↑ Weil, S. 2013 'Ethiopian Jews', in Judith Baskin (ed.) Cambridge Dictionary of Judaism and Jewish Culture, New York: Cambridge University Press, 165-166. ↑ Weil, S. 2008a 'Jews in Ethiopia'; 'Jews in India'; 'The Jews of Pakistan'; 'The Pathans of Afghanistan and their Israelite Status', in M. Avrum Erlich (ed.) Encyclopaedia of the Jewish Diaspora, Santa Barbara: ABC CLIO, 2: 467-475; 3: 1204-1212, 1228-1230, 1230-1231. ↑ Weil, S. 2012b "Longing for Jerusalem Among the Beta Israel of Ethiopia", in Edith Bruder and Tudor Parfitt (eds.) African Zion: Studies in Black Judaism, Cambridge: Cambridge Scholars Publishing, pp. 204-217. ↑ Jon Entine, Abraham’s Children: Race, Identity, and the DNA of the Chosen People, Grand Central Publishing, 2007. p. 149. ↑ Lucotte, G; Smets, P (1999). "Origins of Falasha Jews studied by haplotypes of the Y chromosome". Human Biology. 71 (6): 989–93. PMID 10592688. ↑ Zoossmann-Diskin, A; Ticher, A; Hakim, I; Goldwitch, Z; Rubinstein, A; Bonne-Tamir, B (1991). "Genetic affinities of Ethiopian Jews". Israel Journal of Medical Sciences. 27 (5): 245–51. PMID 2050504. ↑ Hammer, M. F., Redd, A. J., Wood, E. T., Bonner, M. R., Jarjanazi, H., Karafet, T., Santachiara-Benerecetti, S., Oppenheim, A., Jobling, M. A., Jenkins, T., Ostrer, H., Bonné-Tamir, B. "Jewish and Middle Eastern non-Jewish populations share a common pool of Y-chromosome biallelic haplotypes", Proceedings of the National Academy of Sciences, 6 June 2000, vol. 97, no. 12, 6769–6774. ↑ Shen, Peidong; Lavi, Tal; Kivisild, Toomas; Chou, Vivian; Sengun, Deniz; Gefel, Dov; Shpirer, Issac; Woolf, Eilon; Hillel, Jossi (2004). "Reconstruction of patrilineages and matrilineages of Samaritans and other Israeli populations from Y-Chromosome and mitochondrial DNA sequence Variation". Human Mutation. 24 (3): 248–60. doi:10.1002/humu.20077. PMID 15300852. ↑ Sanders, Edith (1963). "The Hamitic Hypothesis: Its Origin and Functions in Time Perspective". Journal of African History. 10 (4): 521–532. JSTOR 179896. ↑ Zachernuk, Philip (1994). "Of Origins and Colonial Order: Southern Nigerians and the 'Hamitic Hypothesis' c. 1870-1970". Journal of African History. 35 (3): 427–55. doi:10.1017/s0021853700026785. JSTOR 182643. ↑ "Ethnic Groups". Library of Congress Country Studies. 1997. Retrieved 2010-10-29. ↑ menl#1 "The People - The Pashtuns" Check |url= value (help). Center for Applied Linguistics (CAL). June 30, 2002. Retrieved 2010-10-29. ↑ Weil, S. 2008 "The Pathans of Afghanistan and their Israelite Status", in M. Avrum Erlich (ed.) Encyclopaedia of the Jewish Diaspora, Santa Barbara: ABC CLIO, 3: 1230-1231. ↑ Introduction: Muhammad Qāsim Hindū Šāh Astarābādī Firištah, History Of The Mohamedan Power In India, The Packard Humanities Institute Persian Texts in Translation (retrieved 10 January 2007). ↑ Haber, M.; Platt, D. E.; Ashrafian Bonab, M.; Youhanna, S. C.; Soria-Hernanz, D. F.; Martínez-Cruz, B. A.; Douaihy, B.; Ghassibe-Sabbagh, M.; Rafatpanah, H.; Ghanbari, M.; Whale, J.; Balanovsky, O.; Wells, R. S.; Comas, D.; Tyler-Smith, C.; Zalloua, P. A.; Genographic, C. (2012). Kayser, Manfred, ed. "Afghanistan's Ethnic Groups Share a Y-Chromosomal Heritage Structured by Historical Events". PLoS ONE. 7 (3): e34288. doi:10.1371/journal.pone.0034288. PMC 3314501 . PMID 22470552. ↑ (Greer, 2004. p57-60) Greer, Nick (2004). The British-Israel Myth. p. 55. ↑ Dimont, C (1933). The Legend of British-Israel. ↑ (Greer, 2004. p57-60) Greer, Nick (2004). The British-Israel Myth. p. 62. ↑ Parfitt, Tudor (2003). The Lost Tribes of Israel: The History of a Myth. Phoenix. p. 66. ↑ Parfitt, Tudor (2003). The Lost Tribes of Israel: The History of a Myth. Phoenix. pp. 66, 76. ↑ Parfitt, Tudor (2003). The Lost Tribes of Israel: The History of a Myth. Phoenix. p. 158. ↑ Israelites Came To Ancient Japan , Arimasa Kubo. ↑ Transcript, INSIDE AFRICA: Current Events on the African Continent, CNN, 11 September 2004. ↑ "The Lemba, The Black Jews of Southern Africa", NOVA episode, PBS. ↑ The Story of the Lemba People by Dr. Rudo Mathivha, 15 October 1999. ↑ Soodyal, H (2013). "Lemba origins revisited: Tracing the ancestry of Y chromosomes in South African and Zimbabwean Lemba". South African Medical Journal. 103 (12). Retrieved 9 May 2014. ↑ Tudor Parfitt's Remarkable Journey Part 2, NOVA, PBS website. 1 2 Parfitt, Tudor (2003). The Lost Tribes of Israel: The History of a Myth. Phoenix. p. 61. ↑ Orr, Ralph (1995). "Anglo-Israelism and the United States & Britain in Prophecy". Grace Communion International. Retrieved 2015-07-08. ↑ "The United States and Britain in Bible Prophecy". Retrieved 2009-01-14. Weil, S. 1989 Beta Israel: A House Divided, Binghamton State University of NewYork. ↑ Parfitt, T: The Lost Tribes of Israel: The History of a Myth, London, 2002, p. 52-65. ↑ Parfitt, T: The Lost Tribes of Israel: The history of a myth, London, 2002, p. 57. ↑ Orr, R: "How Anglo-Israelism Entered Seventh-day Churches of God: A history of the doctrine from John Wilson to Joseph W.Tkach." ↑ "Transformed by Christ: A Brief History of the Worldwide Church of God"
↑ Davidiy, Yair (1996). "The Cimmerians, Scythians, and Israel". Retrieved 2009-02-04. ↑ "Brit-Am Commentary" by Yair Davidiy, Brit-Am website, accessed 10/3/08. ↑ "Biblical Locations of the Lost Ten Tribes: Scriptural Proof," by Yair Davidiy, Brit-Am website, accessed 7/15/08. ↑ "The Khazars and the Scottish," by Yair Davidiy, britam website, accessed 10/3/08. ↑ Hanok. "Israelite and Noahic Haplogroup Hypotheses". Retrieved 2009-02-04. Database of Jewish communities at Beit Hatefutsot in Tel Aviv. - Overview of many hypotheses about the Ten Lost Tribes. Anglo-Israel The History of the Ten "Lost" Tribes by David Baron, "intended primarily as a thorough examination and debunking of Anglo-Israelism"
Where Are the United States and Britain in Prophecy?